I was given the opportunity to drive a truck in the 1952 summer wheat harvest. Bill, my stepfather, and his friend had each bought a new self propelled combine. They also bought two trucks each-one to haul their personal combine and one to haul the wheat to the elevators. 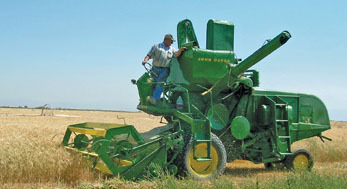 Buck Green was the other combine owner who annually worked the wheat harvest. He had a harvest seasoned 23 year old named Skip driving his backup truck. A commercial drivers license was required. The minimum age for such a license was 18. Someone suggested I submit an application for the commercial chauffeur license, take the test and then use the Temporary License to operate the truck over the summer. I drove to Cameron, Missouri where I took and passed the commercial operators test, received a temporary chauffeur license and my application was sent to the State license bureau. We were a convoy of four trucks led by Buck Green hauling his Combine. Skip followed in Buck's second truck which contained all the support equipment for Buck's combine. Bill was number three with his combine. I was last with Bill's support equipment. We left Kansas City and trucked southwest to somewhere near Amarillo and worked the wheat fields slowly moving north in step with the ripening of the wheat. The combines rode high up on the International Trucks and overhanging wires required frequent stops when going through small towns. We carried long poles to raise the electric and telephone wires high enough to allow passage of the combines. The people were friendly and kind at every place we worked. Once, I missed the only stop light in a town and came to a Y at the edge of town. I went left and soon found myself on the open highway with the visibility at least 40 miles. No combine laden trucks were ahead. I quickly U-turned and went back for the right fork I missed. It was a big relief to catch up with the combines after only 20 minutes. We worked several wheat fields around Wichita Falls. Our last night in a motel there has stuck in my mind all these years. I was late finishing up because the elevator had long truck lines. I reached the restaurant just before closing and was the only patron there. A young girl probably 15 brought the food to my table. She was very pretty but she never smiled. Her face reflected a long, hard days work. I vowed to leave her a $2 tip. I was almost back to the motel when I remembered the tip. I hurried back but found the restaurant had already locked up. The next morning we were gone before daylight on our way to the next town. 58 years later, I still remember and regret not leaving that young lady a tip. The combine convoy continued to work north. The days were hot and long. The big, powerful International trucks held up perfectly. We drove the trucks beside the 50 bushel bins on the combines and took on wheat. When a truck was full, the other wheat truck would pull up beside the combines and offload until that truck was full. If the first truck was not back when the bins became full, the combines had to stop and wait. It was rare that the combines had to wait for a truck. The trucks were not emptying without lots of shoveling and pushing wheat off the hoisted wood beds. Skip and I had muscles as hard as iron from truck load after truck load being offloaded. The elevators hoisted the front of the truck up to 30-40 degrees or we would have really hated the elevators. Some of the wheat farmers had their own silos for storage. That required heavy work shoveling every grain of wheat onto the accumulator from the level truck beds. We wound our way through western Oklahoma and into Colorado. We were at a huge ranch in northeast Colorado as I recall where the wheat was over 4 feet high. It was the highest we had seen throughout the harvest. The combines were choking down with the straw and the operators kept raising the cutters higher. It helped them but then the stubble was about 3 feet high. It was hot and dry at that time. The chaff just lay scattered atop the stubble waiting to be caught up with the hot tailpipe. I was taking on wheat from one combine while Skip was unloading at the elevator. It was like flying formation in Blue Angels flight demonstration team. The truck driver had to set the throttle to match the combine speed and the driver would stand on the floorboards of the truck and steer the truck while adjusting truck position to spread the wheat around the truck bed. I began smelling smoke and looked all around the combine. No visible smoke. Then suddenly flames came up between the cab and the truck bed where I was standing and steering with my right foot. I knew we were in trouble so I shut off the wheat transfer from the combine, jumped down into the cab and did a 180 degree turn back toward the nearest clear spot in the section of wheat. 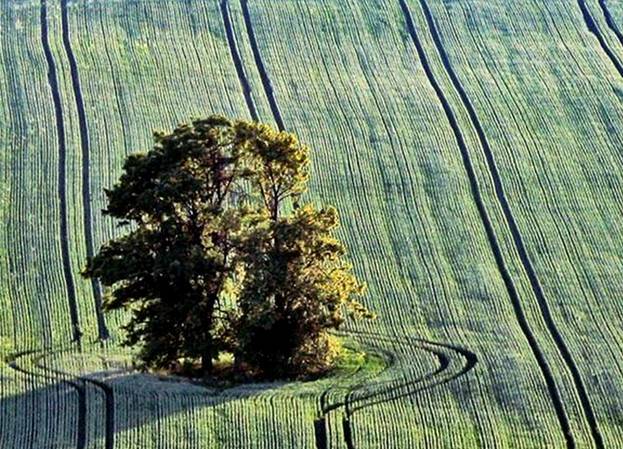 It was a giant oak tree standing alone directly in the middle of the 640 acres. It had only short grass under the oak. I drove the truck under the tree and shut it down. I jumped out of the truck, grabbed the huge wheat shovel stowed between the cab and the front of the truck bed, and ran back up the wheat chaff row beating out the fire I had left in the field. I put out the 200 yard wheat stubble fires and ran back to the burning truck. I could not put out the International truck fire. The truck and the half load of wheat were completely consumed. The next morning the ranch owner brought the newspaper out to us and showed us where an out of control fire in a wheat field just west of us had killed several combine crewmen and workers. Bill, the combine owner, bought me a new red Chevrolet truck with a dump bed. No more back breaking shoveling of the wheat out of the truck bed into the elevators. Skip, the other truck driver, was extremely jealous of my good fortune. A few days later we were on another wheat field. We went to town for lunch and rested at the town park. I was lying on a table top when the combine owners started back. They would start 15-30 minutes before we had to start taking on wheat. I told Skip to wake me when it was time to go. I was awakened by Bill some time later and thoroughly berated for sleeping while everyone was working. Skip had dropped him off while taking the first load to the elevator. 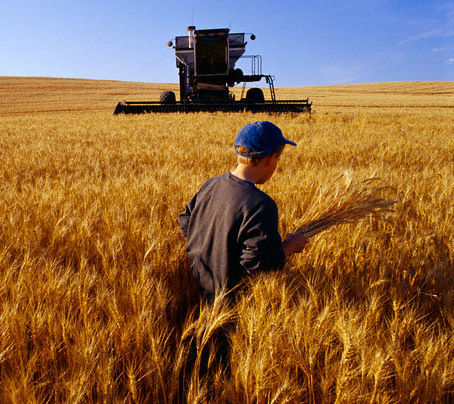 When Skip returned to the wheat field, I dragged him from his truck and began working him over for not awakening me. The dust cloud we created by our thrashing around brought the owner over to put out the fight. I attributed that glitch in our otherwise perfect summer to my acquiring the new Chevrolet with the fancy dump truck bed. Soon, it was late August and since I had to attend high school, the team finished the Colorado wheat fields and packed up and returned home. It was a beautiful drive past the wheat fields and combines as we drove east to Kansas City. 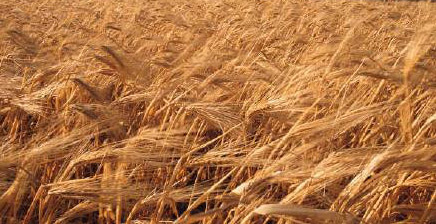 The Wheat Harvest was one of the greatest experiences of my life and ranked up close to the early Marine Corps experience. I found an awaiting notice in the mail box that said my temporary commercial license was revoked and no license would be approved until I retook the test when I was over 18 years old. I figured they would learn from my paperwork that I was underage. However, I had used my temporary license and it had done the job for me.